Bible Fun For Kids: J is for Jesus is Born! A new song by Jeanne Dickson, ideas and printables! These ideas and printables were used at home with preschoolers. They can be used in a Bible class also. I used this Styrofoam cooler that I painted for a manger. 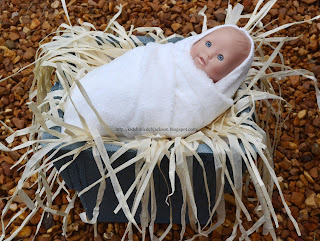 Add a baby doll and raffia and it is a cheap hands-on visual. See directions here. I found these wood mangers with Joseph, Mary & Jesus. Do you know how hard it is to find a manger scene without the wise men? So, I loved this one! They painted this for their project. It is not listed @ www.hobbylobby.com so look for the Christmas kids crafts: Make it Christmas Manger Scene # 5432661. This is a Jesus is Born! Fact Booklet. Print, cut in half and staple. Click here to download in color. Click here to download in black & white. For those of you that prefer less printing than the above booklet, here is a condensed one page foldable to make a booklet. They love this small size! This includes the color and black & white. Here is another wonderful song by Jeanne Dickson. Jeanne has given me pages (☺) of songs with permission to share them with you. We used it at home with this lesson and the kids loved it! Click here to download it. I also created these printables to use with large craft sticks for the above song by Jeanne Dickson. They love these! Teachers can hold up the correct visual for each part of the above song. If possible, make a set for each student to use with you. These can also be printed and let the student retell the facts and put the cards in order. They are in color and black & white. Click here to download. We used our Fisher Price Nativity Set. We also discussed angels do not have wings (cherubim and seraphim's do) and all angels in the Bible were men. Also, the wise men came later when Jesus was about 1 1/2-2 years old (Baby vs. Young Child). I used the basic lesson found here. The visuals and more printable can be found here also. See more ideas and links for the Birth of Jesus here.